Longtime Wu-Tang Clan affiliate and Brooklyn, New York native, Killah Priest returns with a long awaited, highly anticipated album called "The Offering". Best known for his life and career altering appearance on the track "B.I.B.L.E" from GZA's "Liquid Swords" album, his classic debut "Heavy Mental", and for his intensely spiritual lyrics loaded with metaphors and religious references, the former Sunz Of Man group member brings his passion for quality rhymes back on this new release. Priest delivers a monster of an album that features a star studded supporting cast including Nas, Immortal Technique, Ras Kass, Canibus, Kurupt, Hell Razah and more. 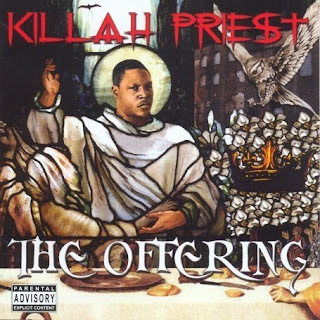 Recent group collaboration projects such as The Black Market Militia and The Horsemen Project have had fans foaming at the mouth for Priest's newest solo effort, and "The Offering" is sure to satisfy their hunger by showcasing why he has been considered one of the top lyricists in the game for years.